The ancient city has developed a master plan to boost the mass use of bicycles among community members and tourists, as part of efforts to make Hoi An a capital of eco-friendly tourism in Vietnam. Architect Dinh Dang Hai from HeathBridge Vietnam said at a workshop on the development of a comprehensive bicycle plan in Hoi An on Wednesday that more than 100 parks, communal gardens and neighbourhood sites have been built to create favourable conditions for pedestrians and cyclists. The workshop, a prelude to the "Establishing a Comprehensive Bicycle Plan and Free/low-cost Bicycle Sharing Programme in Hoi An City" project, was held in co-operation with HeathBridge Vietnam and the city with funding from the German development agency (GIZ). 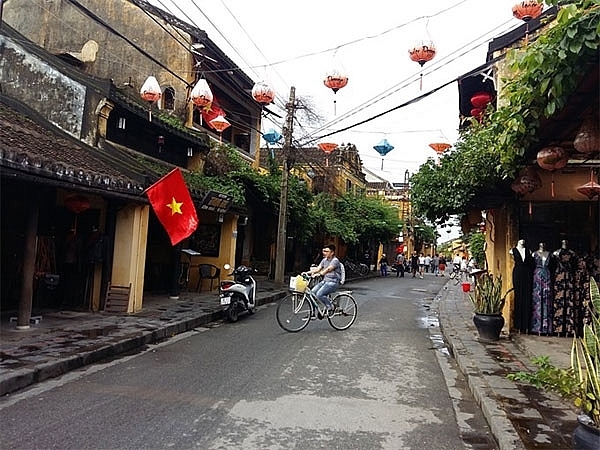 “Hoi An is seen as the first urban locality in Vietnam developing plans for non-engine transport and pedestrian streets,” Hai said. Kim Lua from the World Resources Institute suggested that good design is the key to a safe biking environment in Hoi An. Nguyen Su, former party secretary of the city, urged the city’s leaders to use bicycles for their daily commutes. Su said Hoi An is a small city with many destinations within a 5km distance, and mass bicycle use could be possible.